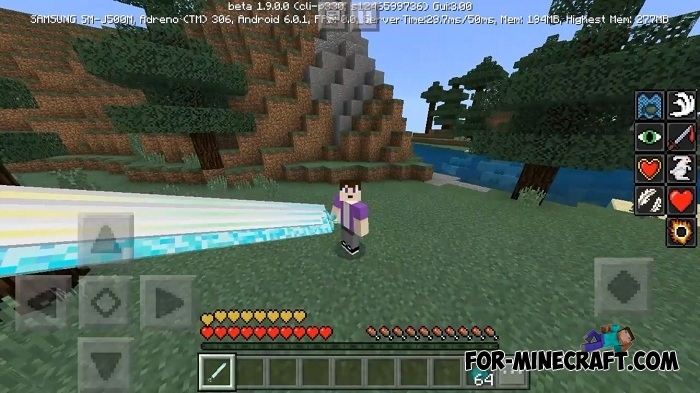 Only the greatest warrior of all time is able to take this sword and control it, because there has never been such a weapon in Minecraft BE before. This powerful weapon is called Aaron’s Long Sword and is so huge that it is many times larger than any player and most sentient beings. Its power is enough to destroy anyone who stands in its way. Do you need such a powerful and dangerous weapon that will become an invincible tool in your hands? Then try to raise it and attack your most evil and intolerable enemy. Aaron’s Long Sword has a set of effects that increase the normal impact force and fill weapons with abilities like night vision and underwater breathing. In general, this sword will be your main advantage over anyone. With it, it’s not difficult to go to hell or destroy entire outposts that will soon appear in Minecraft Bedrock Edition. How to install the Aaron’s Long Sword addon?